Right now, we’re experiencing some of the most beautiful weather one could ask for, so I ask you all this: Where have you been dining outdoors this season? At home? By the waterside? On the top of a mountain? 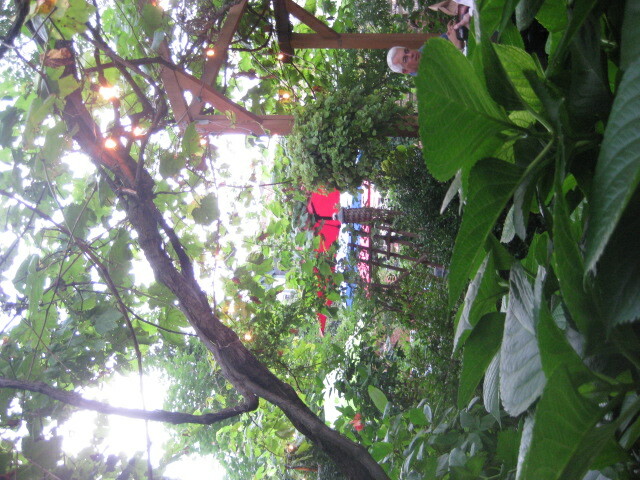 At an upper Lawrenceville Thai restaurant dominated by its pastoral picture book of a garden? But oh, that garden. That garden! There’s a special feeling when eating amidst such verdant beauty. You’re outside, but you feel tucked away in your own private garden. There are diners all around, yet somehow it feels sublimely intimate. All around you there is distraction – a cluster of interesting flowers, an imposing thrust of green leaves as thick as the napkins on the table, a scattering of herbs all around, and of course, the frame and trellis providing a modest barrier with only the barest of woodwork. It’s rustic, elegant, sophisticated gardening gone just wild enough on the edges to make one feel like you could get lost without the tables to guide your way. To put it another way, although you’re seconds away from Butler Street, you feel as if you could be dining in a garden in the middle of nowhere. 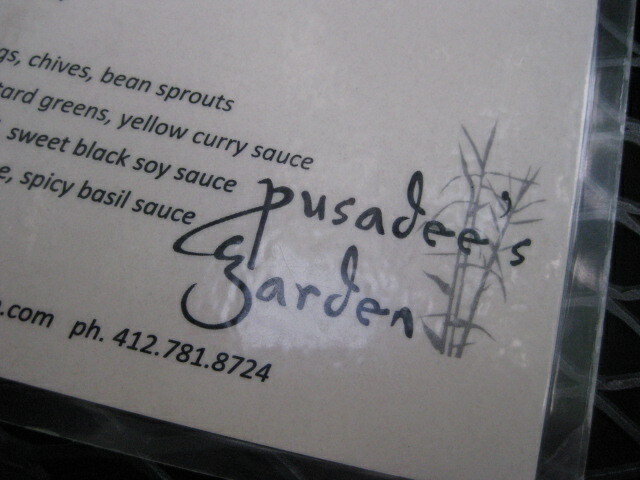 It’s a pastoral entrancement that translates into the meal itself. 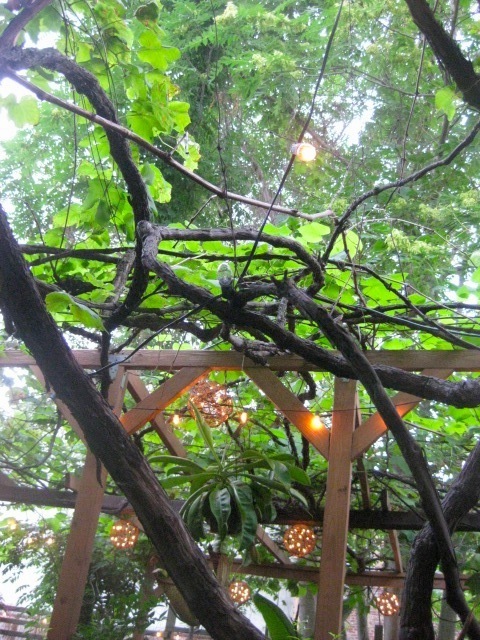 More than uplifting the normal dining experience, the garden setting somehow accentuates the flavors of the meal. The psychic effect of so much fresh-grown flora is a heightened concentration on the fresh flavors of the food. When not distracted by the scenery, me and my dining companion, Jackie, focused in on the menu, a straightforward mix of Thai classics, including soups, curries, noodle and rice dishes, and “garden” specialties. Bar-and-restaurants are not created equal. For every notable, really decent place to grab a brew and some food, there are at least a dozen that are notable only in their place-less, generic nature. These sub-par establishments usually serve the same blend of tasteless, mediocre (and below) food at junk prices to complement whatever beer special is attracting the local population. This isn’t meant as an insult to these places. A perfectly fine watering hole does not guarantee a decent place to eat, but that does not negate the positives of visiting. You just have to keep your expectations in line with where you are. The problem with setting expectations, however, is that it’s often difficult to discern the good from the bad upon initial glance. Some sparkly, polished, pre-fab pubs offer dismal food offerings, while some of the dingiest, grimiest hole-in-the-walls conceal culinary treasures worthy of frequent visits with or without drinking. 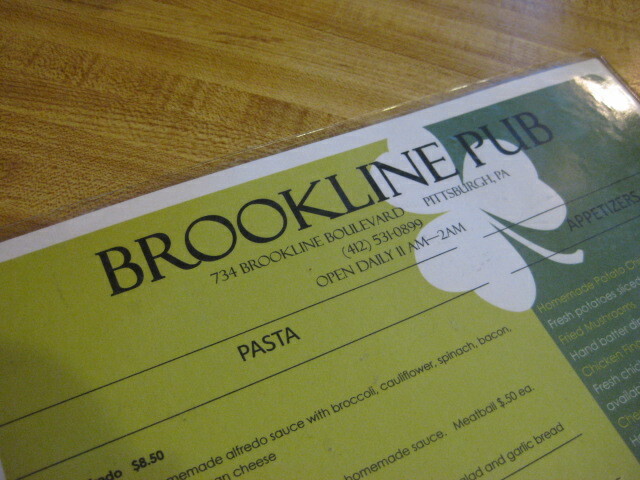 Situated in the middle of the business district on Brookline Boulevard, Brookline Pub certainly has its location going for it. 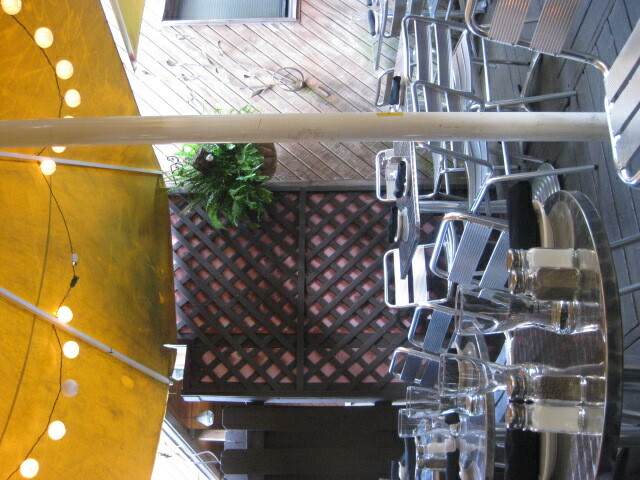 Also to its favor: The multi-room set-up, including a sheltered patio area and an enclosed dedicated non-smoking room. 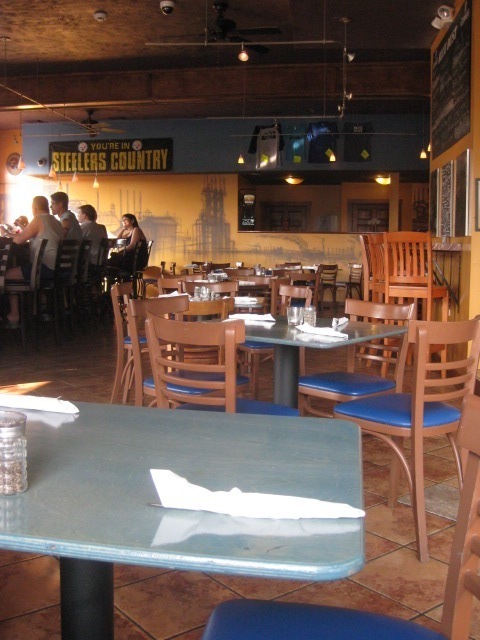 The main area is taken up by a smattering of tables and chairs, with the bar dead center. Given its size, location, and agreeable price-point, it excels as a place to grab a cold one, but as a spot to get some grub, it proved less desirable. Anyone who has watched a considerable amount of Gordon Ramsey’s Kitchen Nightmares can tell you that one of the main problems found in most mid-level restaurants is that the menu is too large. While a laminated double-sided menu doesn’t seem like it would be huge, Brookline Pub manages to pack a lot of stuff onto both ends, including a list of wing flavors numbering somewhere around twenty. Quantity and variety seem like positives, but so many options give the kitchen little time to specialize and strengthen specific meals. Everything ends up mediocre, and because there is so much of it, that’s a whole lot of mediocre. Worse still, the mediocre offerings were on classic bar menu items, proving that even something as simple as a chicken wing or pierogi can be undone by lackluster preparation. Pittsburghers have a weird relationship with our industrial past, an equal split of looking backward and forward. We want to move into the future eschewing all that limited us in the past, but our lives and the overall life of our city is irrevocably tied to those very same limitations. We make shopping centers out of smokestacks, but we’re still learning how to address the past concern while retaining a contemporary focus. This tension is evident in all matter of city-living, including dining out of both high and low end varieties. Truth be told, the more casual, low-key establishments have the edge. However intriguingly the local past is interpreted by the latest four-star restaurant, our industrial roots are far more linked into the culture of the watering hole, the post-work drinking spot, the refuge of idle for those with far too much weight to carry. It’s very possible to envision the direct ancestors of Blue Dust as the type of safe haven for the sullen, sullied masses, even as the present-day variation features accommodations unknown to that history. Its placement – just over the railroad tracks from the Waterfront in Homestead – is indicative of the type of establishment it means to be, the type of establishment far more linked with the Homestead of yore than the glossy, consumer-paradise of today. Pittsburgh’s industrial past is represented not just in placement but in decor. Dusky impressions of mills and factories adorn the far wall and the lighting is spare but golden, hanging from metal rods and fixtures that give the restaurant a factory-floor feel echoed by the earthy color of the tiles and woodwork. 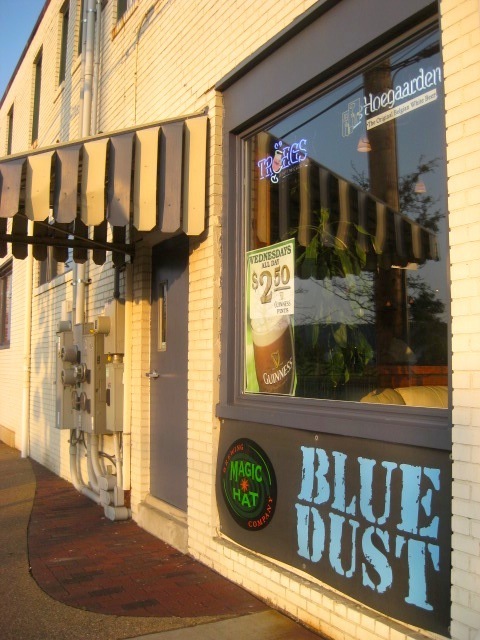 As a simple, stylish homage to Pittsburgh’s roots, Blue Dust’s decor and atmosphere succeeds. But what of its menu? Does it hearken back to the old days of simple, nourishing foods? 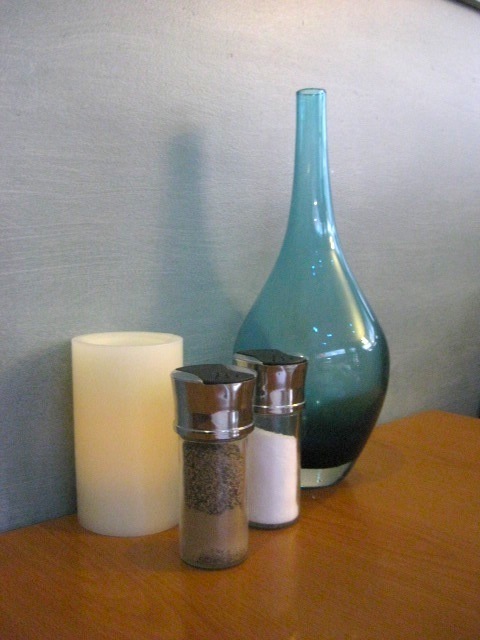 Or does it play it safe by sticking to contemporary bar/restaurant casual dining staples? To that question, there isn’t an easy answer. While we have many restaurants on the river, so where can you go is not an issue. Where should you go… well, that’s an entirely different story. Like any waterfront real estate, properties by the riverside are highly sought after. The ability to dine while overlooking a body of water will never go out of favor – just ask the fine folks of some of the most mediocre restaurants lining our East Coast beaches. It really doesn’t seem to matter to most waterfront restaurants whether their food is of decent quality, their staff well trained, efficient, and friendly, or even their interior atmosphere welcoming. The whole sell is that they’re on the water, which puts their diners that much closer to the water, and that setting in of itself is enough to get people through the door. There are exceptions, of course. And then there are places like Silky’s Crow’s Nest, which is neither the exception nor the rule waterfront dining, but instead inhabits a limbo between above-par dining and sub-par riverside stride. But, as with many places of its type, the bar and restaurant requires the diner to set their expectations realistically. When reaching for a menu item just a bit above ordinary, the chances of their kitchen turning out something splendid is fairly slim. Settler’s Ridge is about what you’d expect from the latest fashion of shopping areas. It’s expansive and open air. It’s filled to the brim with stores and restaurants of both high-class and mid-level appeal. It’s got a big movie theater. It’s got an even bigger Giant Eagle Market District, looming in the corner like an airport hanger filled with food. It’s a huge maze of parking and commerce that on a busy Friday evening can drive a person to the brink of madness. What a relief, then, that nestled in there, next to the movie theater, down the sidewalk from the monstrous and cacophony-laden Cadillac Ranch is a little oasis of calm? 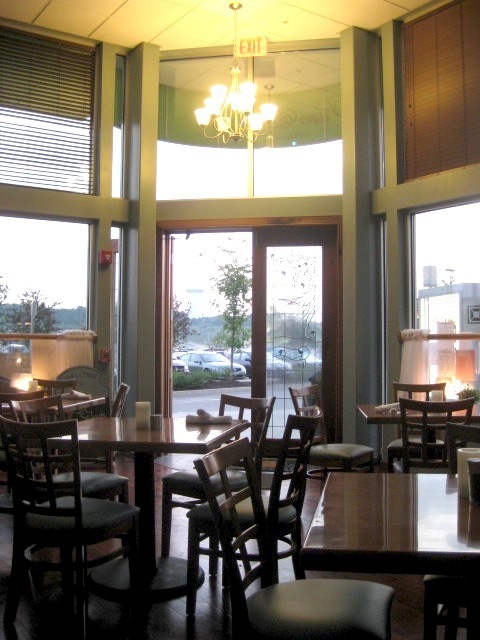 Pure & Simple Bistro is about as far away from its neighboring establishments as it can get without an actual physical relocation. As quiet as the others are loud, as simple as the others are high concept, as low-key as the others are high energy, P&S is sweet Southern cooking with an emphasis on fresh, local ingredients and simple, classic dishes done with careful attention paid toward proportion and quality. Pittsburghers are often criticized for their so-called lack of sophistication when it comes to dining, but as a recent comment in the Pittsburgh City Paper pointed out, the attention and following of food trends has significantly increased in the last couple of years. We might not be New York City or San Francisco or Chicago or even (thank goodness) Seattle, but we’re not slacking in developing a contemporary culinary landscape. Well, not slacking as much. We’ve gone from being several years behind the times in trends to several months behind, and that’s progress that I’m happy with, especially when you consider how much other cities have had to sacrifice to make both physical and consumer room for hot new eateries. It’s all well and good that you can try great culinary feats of unbelievable invention and quality, but that doesn’t mean you’re not going to miss those greasy spoon, all-night diners when they’re all but an indigestion-causing memory. We still have space enough for both the upscale and lowbrow, and as a result, there is plenty to be found in both directions. 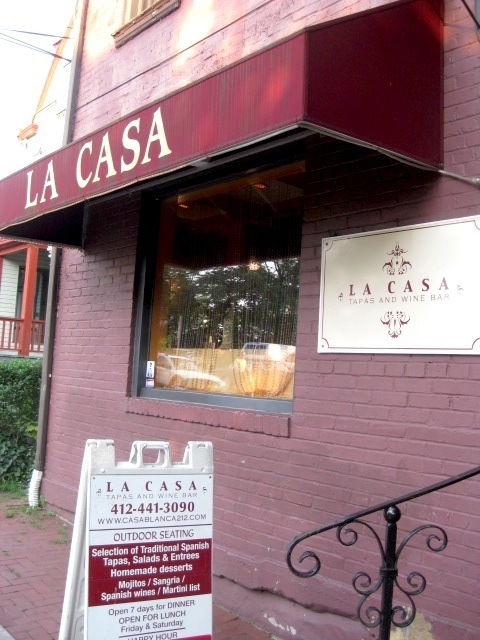 But if one we’re looking to sample a stretch of businesses that are strictly in the realm of the posh, Ellsworth Avenue in Shadyside is a good street to try, and La Casa is the right place to start. Nestled in the far corner of Ellsworth, La Casa’s back patio feels miles away from its neighbors, and yet, just peeking over the fences, there is the neighborhood. It’s the magic of Moroccan and Spanish tapas combined with killer sangria, the romance of little golden lights and big, artfully shabby umbrellas. As a spot for pre-dinner drinks and snacks and conversation it works splendidly. Oh, the question. In any conversation, an enthusiast silently and secretly waits for the question to be asked. It’s the question that once asked will unlock the bounty of knowledge that is at constant unrest inside the brain of the enthusiast. The question that will unleash a torrent of thoughts, opinions and pontifications. When presented to some people, the question will cause a four-hour marathon one-sided conversation that will consist of more exclamations and excited hand gestures then an average person experiences in a month’s time. Anyone who has a sincere passion for something anticipates the question being asked. In my case, its anticipation coupled with nervousness, because I’m not entirely confident in the amount of my knowledge on my given topic of interest. I’m interested, invested, but how schooled am I? It should be simple enough to answer a basic question like “What are some good places you know?” but asked at the wrong time and my mind goes completely blank. It can lead to pretty mediocre suggestions. Anyway, for people like me who have trouble thinking on their feet (and in their stomachs), Urbanspoon – apologies if it seems like I’m mentioning this site a lot, I just seem to have endless uses for it – allows its members to save desired restaurant finds on a wishlist. Mine started off small enough – a few highly lauded locations – but quickly ballooned. At first, I tried to stick to stuff that was seemingly doable, places in my average price range or easily accessible to my location, but now, I just add anything recommended to me or that sounds desirable in any way. What’s more, I’ve become a bit of a new restaurant hunter and have started to watch the listings of new places recently opened or soon to be opened, and now I add those listings onto my wishlist. 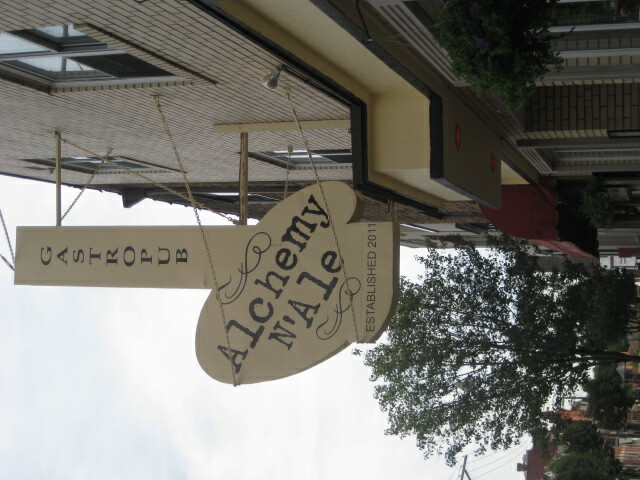 That long and rambling tangent was how we ended up at Alchemy N’ Ale, a new restaurant on Butler Street in Lawrenceville, taking over the spot left vacant by the departed Mama Rosa. The co-owner and head chef of A’N’A served as executive chef at Tribeca Grill in New York, known for its star-studded clientele and star-driven ownership (Robert De Niro is a co-owner), and he’s brought a similar culinary sensibility to this gastropub, only at a slightly more affordable price range for the average Pittsburgh diners. So, how did the wishlist gamble pay off?